Krusell produces and globally distributes fun, fashionable, unique, designer carrying cases and pouches for portable electronics including mobile phones, Smartphones, Laptops, GPS, digital cameras and MP3-players. Krusell is the patent holder of the unique Multidapt carrying system. At the heart of Krusell carry cases is the Multidapt system. The Muitidapt system is uniquely designed to enable the case user to take a Krusell the way the prefer. Krusell users can choose between several belt clips and belt loops including fixed and swivel. They can also elect to use no clip at all and have a relatively flat back with only the small bulge of the Multidapt base. Multidapt® clips and swivels are all compatible with the Multidapt® receiver that gives you a range of options on how to carry your device. Krusell continues to renew their product range with new collections of fashionable mobile cases for iPhone, BlackBerry, HTC, Nokia, Samsung and other mobile phones. 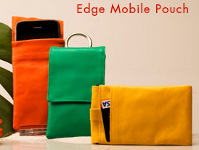 Their products focus on the men and women that want to protect their portable electronic products with style. Their cases and pouches contain details and materials such as; Smooth leather, studs accents and a sophisticated color palette. Krusell is moving towards the merge of fashion accessories and electronic devices. Today electronics are fashion, and so are the accessories. "You are what you wear", has never been as obvious as today. With its extensive product range, Krusell has a total of more than 600 various cases that fits more than 5000 various electronic devices. Krusell International AB with 130 million SEK in turnover and 300 employees is a Swedish company exporting high-end cases around the world. After more than 15 years in the cell phone industry, Krusell is established as one of the leading brands in its niche. Besides cases for mobile phones, Krusell also produces cases for digital cameras, laptops, MP3-players, GPS and portable gaming. Most Krusell cases sold have their patented carrying solution, Multidapt. The headquarters of Krusell is located in Sweden.